Husserl's phenomenology has often been criticized for its Cartesian, fundamentalistic, idealistic and solipsistic nature. Today, this widespread interpretation must be regarded as being outdated, since it gives but a very partial and limited picture of Husserl's thinking. The continuing publication of Husserl's research manuscripts has disclosed analyses which have made it necessary to revise and modify a number of standard readings. This anthology documents the recent development in Husserl research. It contains contributions from a number of young phenomenologists, who haveall defended their dissertation on Husserl in the nineties, and it presents a new type of interpretation which emphasizes the dimensions of facticity, passivity, alterity and ethics in Husserl's thinking. Depraz, N. , Zahavi, D. (eds) (1998). 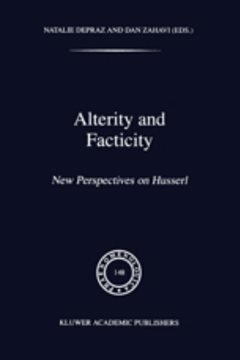 Alterity and facticity: New perspectives on Husserl, Kluwer, Dordrecht.